The OAuth 2.0 On-Behalf-Of (OBO) flow enables an application that invokes a service or web API to pass user authentication to another service or web API. The OBO flow propagates the delegated user identity and permissions through the request chain. For the middle-tier service to make authenticated requests to the downstream service, it must secure an access token from Azure Active Directory (Azure AD) on behalf of the user. As of May 2018, an id_token can't be used for the On-Behalf-Of flow. Single-page apps (SPAs) must pass an access token to a middle-tier confidential client to perform OBO flows. For more detail about the clients that can perform On-Behalf-Of calls, see limitations. The OBO flow starts after the user has been authenticated on an application that uses the OAuth 2.0 authorization code grant flow. At that point, the application sends an access token (token A) to the middle-tier web API (API A) containing the user’s claims and consent to access API A. Next, API A makes an authenticated request to the downstream web API (API B). 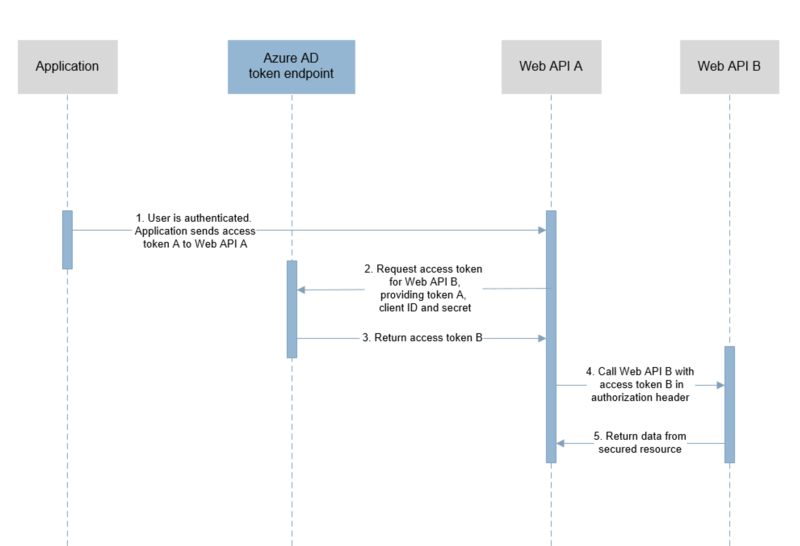 The client application makes a request to API A with the token A.
API A authenticates to the Azure AD token issuance endpoint and requests a token to access API B. The Azure AD token issuance endpoint validates API A's credentials with token A and issues the access token for API B (token B). The request to API B contains token B in the authorization header. API B returns data from the secured resource. The audience claim in an access token used to request a token for a downstream service must be the ID of the service making the OBO request. The token also must be signed with the Azure Active Directory global signing key (which is the default for applications registered via App registrations in the portal). Register both the middle-tier service and the client application in Azure AD. On the top bar, select your account and look under the Directory list to select an Active Directory tenant for your application. Select More Services on the left pane and choose Azure Active Directory. Select App registrations and then New application registration. Enter a friendly name for the application and select the application type. Depending upon the application type, set either the sign-on URL or the redirect URL to the base URL. Select Create to create the application. Generate a client secret before exiting the Azure portal. In the Azure portal, choose your application and select Settings. Select Keys in the Settings menu and add a key with a key duration of either one year or two years. When you save this page, the Azure portal displays the key value. Copy and save the key value in a safe location. You need the key to configure the application settings in your implementation. This key value is not displayed again, and it isn't retrievable by any other means. Record it as soon as it is visible in the Azure portal. Configure permissions for your application. In the Settings menu, choose the Required permissions section, and then select Add and Select an API. Type the name of the middle-tier service in the text field. Choose Select Permissions and then select Access service name. In this scenario, the middle-tier service needs to obtain the user's consent to access the downstream API without a user interaction. The option to grant access to the downstream API must be presented up front as part of the consent step during authentication. Follow the steps below to explicitly bind the client app's registration in Azure AD with the middle-tier service's registration. This operation merges the consent required by both the client and middle-tier into a single dialog. Go to the middle-tier service registration and select Manifest to open the manifest editor. Locate the knownClientApplications array property and add the client ID of the client application as an element. Save the manifest by selecting Save. The client application is secured either by a shared secret or by a certificate. grant_type required The type of the token request. An OBO request uses a JSON Web Token (JWT) so the value must be urn:ietf:params:oauth:grant-type:jwt-bearer. assertion required The value of the access token used in the request. client_id required The app ID assigned to the calling service during registration with Azure AD. To find the app ID in the Azure portal, select Active Directory, choose the directory, and then select the application name. client_secret required The key registered for the calling service in Azure AD. This value should have been noted at the time of registration. resource required The app ID URI of the receiving service (secured resource). To find the app ID URI in the Azure portal, select Active Directory and choose the directory. Select the application name, choose All settings, and then select Properties. requested_token_use required Specifies how the request should be processed. In the On-Behalf-Of flow, the value must be on_behalf_of. scope required A space separated list of scopes for the token request. For OpenID Connect, the scope openid must be specified. The following HTTP POST requests an access token for the https://graph.windows.net web API. The client_id identifies the service that requests the access token. grant_type required The type of the token request. An OBO request uses a JWT access token so the value must be urn:ietf:params:oauth:grant-type:jwt-bearer. assertion required The value of the token used in the request. client_assertion required A JSON Web Token that you create and sign with the certificate you registered as credentials for your application. See certificate credentials to learn about assertion format and about how to register your certificate. These parameters are almost the same as with the request by shared secret except that the client_secret parameter is replaced by two parameters: client_assertion_type and client_assertion. The following HTTP POST requests an access token for the https://graph.windows.net web API with a certificate. The client_id identifies the service that requests the access token. token_type Indicates the token type value. The only type that Azure AD supports is Bearer. For more information about bearer tokens, see the OAuth 2.0 Authorization Framework: Bearer Token Usage (RFC 6750). scope The scope of access granted in the token. expires_in The length of time the access token is valid (in seconds). resource The app ID URI of the receiving service (secured resource). access_token The requested access token. The calling service can use this token to authenticate to the receiving service. id_token The requested ID token. The calling service can use this token to verify the user's identity and begin a session with the user. refresh_token The refresh token for the requested access token. The calling service can use this token to request another access token after the current access token expires. The following example shows a success response to a request for an access token for the https://graph.windows.net web API. The Azure AD token endpoint returns an error response when it tries to acquire an access token for a downstream API that is set with a conditional access policy (for example, multi-factor authentication). The middle-tier service should surface this error to the client application so that the client application can provide the user interaction to satisfy the conditional access policy. The middle-tier service can use the acquired access token to make authenticated requests to the downstream web API by setting the token in the Authorization header. Some OAuth-based web services need to access other web service APIs that accept SAML assertions in non-interactive flows. Azure Active Directory can provide a SAML assertion in response to an On-Behalf-Of flow that uses a SAML-based web service as a target resource. This is a non-standard extension to the OAuth 2.0 On-Behalf-Of flow that allows an OAuth2-based application to access web service API endpoints that consume SAML tokens. When you call a SAML-protected web service from a front-end web application, you can simply call the API and initiate a normal interactive authentication flow with the user's existing session. You only need to use an OBO flow when a service-to-service call requires a SAML token to provide user context. grant_type required The type of the token request. For a request that uses a JWT, the value must be urn:ietf:params:oauth:grant-type:jwt-bearer. resource required The app ID URI of the receiving service (secured resource). This is the resource that will be the Audience of the SAML token. To find the app ID URI in the Azure portal, select Active Directory and choose the directory. Select the application name, choose All settings, and then select Properties. requested_token_type required Specifies the type of token requested. The value can be urn:ietf:params:oauth:token-type:saml2 or urn:ietf:params:oauth:token-type:saml1 depending on the requirements of the accessed resource. The response contains a SAML token encoded in UTF8 and Base64url. SubjectConfirmationData for a SAML assertion sourced from an OBO call: If the target application requires a recipient value in SubjectConfirmationData, then the value must be a non-wildcard Reply URL in the resource application configuration. The SubjectConfirmationData node: The node can't contain an InResponseTo attribute since it's not part of a SAML response. The application receiving the SAML token must be able to accept the SAML assertion without an InResponseTo attribute. Consent: Consent must have been granted to receive a SAML token containing user data on an OAuth flow. For information on permissions and obtaining administrator consent, see Permissions and consent in the Azure Active Directory v1.0 endpoint. token_type Indicates the token type value. The only type that Azure AD supports is Bearer. For more information about bearer tokens, see OAuth 2.0 Authorization Framework: Bearer Token Usage (RFC 6750). access_token The parameter that returns the SAML assertion. refresh_token The refresh token. The calling service can use this token to request another access token after the current SAML assertion expires. Public clients with wildcard reply URLs can't use an id_token for OBO flows. However, a confidential client can still redeem access tokens acquired through the implicit grant flow even if the public client has a wildcard redirect URI registered.